image processing. 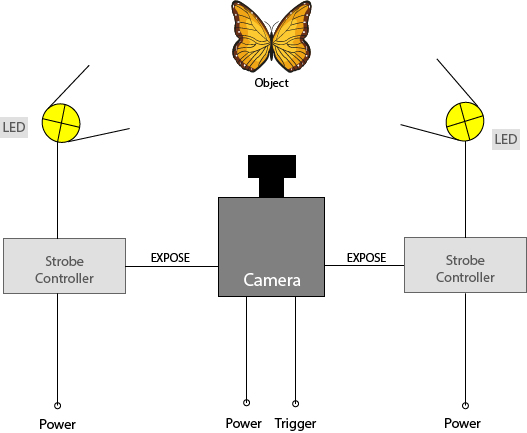 Strobe controllers drive the lighting to make sure the the camera finds a well illuminated object. Is there a reason for strobe controllers? For automated image processing, shifting illumination conditions might turn out as massive obstacles. Therefore a machine vision core requirement is a well defined illumination. Strobe controllers guarantee the perfect illumination of the object. This helps to improve speed and reliability of the machine vision process - and has a positive economic effect. Additionally, strobe controllers enable significantly higher light output compared to plain illumination. For avoiding motion blur with (fast) moving objects, it is best to choose short exposure times. Typical exposure times are in the range of milliseconds or microseconds. As a drawback, the shorter the exposure time, the more light is required to illuminate the object. Nowadays LED lights are used nearly solely. They provide a long lifetime, they're up to their maximum luminous flux very quickly after power on, they feature a high efficiency factor and a small construction form. The emitted light does show a constant spectral curve without big variations with different power drain or in lifespan. Optical emission of LED light sources is proportional to electrical current. The current is basis for the emitted amount of light as well as thermal dissipation power. Showing a proportional light output over a wide mid range of operating conditions, LEDs do have significant differences in maximum parameters and low power switching thresholds. Thus it makes sense to regulate via the current and not the voltage of the LED light source. This is the domain of the strobe controller. In general, a strobe controller is controlling power on and off of the attached light as well as the light source's brightness. Nearly exclusively, it is connected regulating the current, what means the LED's current can be adjusted precisely. Power on and off of the LED has to be synchronous with exposure time of the camera. Normally, the camera's EXPOSURE signal is used for this. 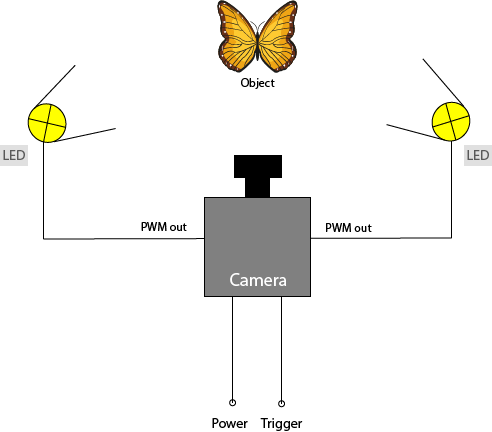 The camera trigger signal is used to power on the LED lighting for a preadjusted amount of time (can be used for high power applications with LEDs needing a long time to come up). This mode can be used as exposure control as well. Some controllers provide additional features as adjustable current ramps, delays, sequences, recognizing of LED head and stuff. A special benefit of strobe controller is the ability to overdrive the LED in flash mode. As being said, LEDs are sensitive to heat. If dissipation power makes them overheat, they will die. Because of this the LED manufacturer's notice regarding maximum current should be taken into account. As the dissipated thermal power is an integral over time, there is the possibility to drive the LED with a current significantly higher than the manufacturer's spec. The on-time should be as short as possible then. The result will be higher light flux, but the lifespan might be affected negative. As explained above, while ON the LED is running with an electrical current much higher than the LED's spec. Because of current and light flux are proportioanl, the light output is higher as well. While the camera is not exposing, the LED is dark and can cool down again. 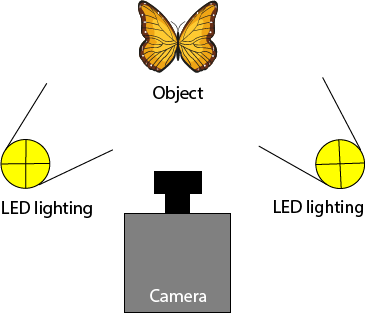 The result is a higher light intensity while exposure of the camera. Short exposure times are preferrable to avoid blur effects. This creates the request for more light. So LED overdrive often comes in quite handy. Standard strobe controllers are controlling voltage or current of the LED - emitting a lot of disipation power themselves. PWM strobe controllers are based on a different principle: The light intensity of the LED is adjusted by pulse width modulation (PWM). The PWM controller does not affect the maximum current but is powering on and off the LED (with very high frequency). Brightness of the LED results by the percentage of the ON time. The electrical current is maximum current, always, according to Ohm's law I = U / R. Depending on the LED spec, a shunt resistor might be necessary to drive a LED lighting equipment with a PWM controller. Hardly any dissipation power is created on the controller side. With the innovative 4IO concept SVS-Vistek created cameras with integrated PWM strobe controller. Industrial cameras always have the same task, taking similar images all the time (take same image with well defined illumination). As you always need a light controller together with the camera, it does make sense to integrate the strobe controller into the camera. Being part of the 4IO concept, SVS-Vistek is providing cameras with integrated multi channel PWM strobe controller already for years. With a maximum current of 3 Ampere (see specs) this makes them suitable for more than 90% of today's applications. System integrators like the possibility to access camera and strobe controller with a single SDK. This does result in transparent, slim applications: In terms of space, in field cabling as well as in programming and - finally - in pricing.